Only several decades ago, most climatologists and other climate experts declined to opine whether any extreme weather event was related to climate change. The consensus was that there was insufficient data, modeling and understanding to connect the dots between a specific storm, heat wave or other extreme weather event and the long term climate changes unfolding from emissions of greenhouse gases (GHGs). Most were concerned that making such connections could undermine the science of climate change, especially in light of the concerted attacks from the fossil fuel interests and their political supporters. That has all changed. With technological developments and the growing sophistication of computer modeling, and the accumulating data on emissions and conditions across the globe, there is growing confidence in connecting more and more dots between weather events and climate change. While experts still are reluctant to say that climate change caused any particular extreme weather event, they are increasingly confident in saying that some extreme weather events are occurring more frequently, and/or are more severe when they do happen, because of climate change. For example, the Penn State meteorologist Michael Mann has written that we cannot say that Hurricane Harvey was caused by climate change, but it was certainly worsened by it. Sea-level rise and unusually warm ocean temperatures, caused by climate change, exacerbated several characteristics of the storm in a way that greatly increased the risk of damage and loss of life. Building houses along coasts that do and will flood did not help either. An example of this developing science of extreme weather attribution is Euro-Mediterranean Heat — Summer 2017 by World Weather Attribution. World Weather Attribution (WWA) is a partnership of Climate Central, the University of Oxford Environmental Change Institute (Oxford ECI), the Royal Netherlands Meteorological Institute (KNMI), the University of Melbourne, and the Red Cross Red Crescent Climate Centre (the Climate Centre). It was started in 2014 “after discussions within the scientific community concluded that the emerging science of extreme-event attribution could be operationalized.” Climate Central coordinates the program and provides its secretariat. WWA, Our Story (See Sources). WWA studied the extreme heat events in Western Europe and the Euro-Mediterranean area in the summer of 2017, focusing on the three-month period of June to August, and the three-day heat wave in early August, known as Lucifer, centered in southeast Europe. In June through August, France, Switzerland, Belgium, the Netherlands, England, Portugal and Spain experienced record-breaking high temperatures. Portugal and Spain had monthly averaged maximum temperatures 4°C above normal (1981-2010), with temperatures reaching as high as 40.6°C (105°F) in Madrid. In August, maximum temperatures in Italy and the Balkans topped 40°C (104°F) for several days; night-time temperatures remained above 30°C (86°F) in Corsica and Croatia; and, southern Poland had abnormally high temperatures. The entire summer was brutally hot. Of course southern Europe typically has warm summers with some very hot days. 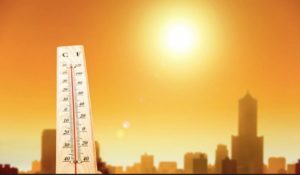 But it was the sustained extreme hot days that became particularly dangerous, especially for the very young and elderly, and the vulnerable populations who suffer from heart conditions, high blood pressure and asthma. Interestingly the study notes that tourists are also at increased risk as they spend lots of time outdoors and are not used to such heat. These stressful conditions also led to high energy and water use, which strained such resources. Increased hospital admissions for people with heat-related conditions were reported during this 2017 heat wave, and an increase in deaths is expected when analyses are completed. Forest fires were reported in numerous affected countries, with tourists evacuated. 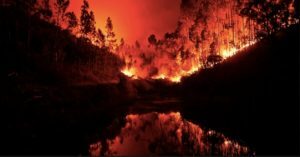 More than 60 people died from fires in Portugal in June. The agriculture sector was hit hard. Bosnia lost half its normal agriculture output and 10% of its economic income; Serbia lost about 1/3 of its soybean and corn crops; and Italy lost billions, including from damages to its grape harvests. In some affected areas, outdoor work was banned. To assess the connections between these extreme heat events and climate change, the WWA examined five climate models and modeling initiatives, each of which is discussed in the study. The models were run with and without “human-caused emissions of greenhouse gases and aerosols, allowing us to isolate and quantify the influence of human-induced climate change on the likelihood of June warm spells within the climate models.” At 18-19. The study concluded that the model results demonstrated that “past historical increases in greenhouse gases have raised the odds of a warm summer in the Euro-Mediterranean box considerably. The observed trend is compatible with the effects of human-induced emissions of greenhouse gases.” At 18. Extending those model results into the future indicates that there is a 1 in 10 chance every year for heat waves at least as hot as those in the Euro-Mediterranean summer of 2017. Climate change has increased the chances of a summer as hot as 2017 by at least a factor of 10 and a heat wave like Lucifer by at least a factor of four since 1900. The proverbial bottom line is that what people experienced in the 2017 heat waves will be the new normal in the Euro-Mediterranean region by 2050, just 33 years away. To say that an extreme weather event, or its impacts, can be attributed to climate change with more confidence does not say that all extreme weather events can be connected to climate change. It all depends on a close analysis of the specific atmospheric and environmental conditions, as well as land uses, impacting on the events as to whether climate change has affected the event. For instance, wild fires are complicated because they can be affected by a variety of climate-related factors — drier vegetation, more lightning, earlier springs with longer fire season, and more strong, dry winds — as well as by non-weather factors, such as zoning and other land use regulations (e.g., allowing building of homes in fire-prone areas). All these factors can affect the frequency and intensity of fires in most places. Yet it can be said with confidence that some places will be affected more than others. For example, California is subject to strong, dry winds like the Diablo winds in northern California and the Santa Ana winds in southern California. Climate change research indicates that these winds will be more intense with global warming, and as a result California will be subjected to more, and more intense, wild fires. It is also fair to note that saying that a particular weather event cannot be connected to climate change does not mean that there is no connection, only that current data and technology does not allow scientists to see any connection. Michael Mann, “It’s a fact: climate change made Hurricane Harvey more deadly,” The Guardian (28 August 2017). Andrea Thompson, “Attribution Studies Home in on Climate Change Signal,” Climate Central (5 Nov 2017). Chelsea Harvey, “Here’s What We Know about Wildfires and Climate Change,” Scientific American (13 Oct 2017).